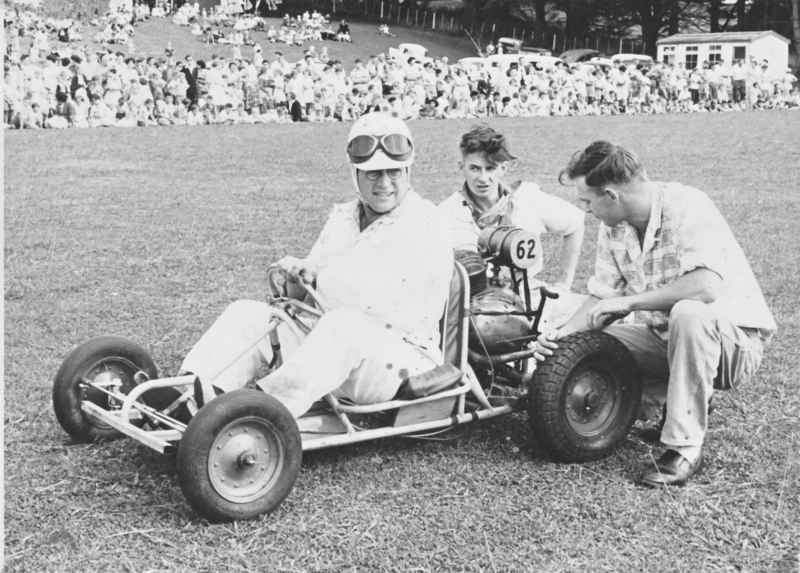 Johnny Callender and more recently his son Laurie, have made a big contribution to the running of Speedways and other motorsport in Taranaki and further afield. This club has President Laurie Callender as our leader. He started this organisation in 2002. The following is from an interview with Mrs. Nola Callender in Jan. 2006. Johnny's widow at the time. The family lived then in Clemow Rd. and remained in the same house until much later they shifted to Auckland. Later when Laurie had started school Mrs. C was visited by the local constable who said Laurie had been scribbling on the local jeweller’s door. “I know it was Laurie, he said, because he signed his name!” The cop thought it was hilarious but left Johnny to tell Laurie off. Johnny was working at this time for Rowe and Healey who had a motor cycle franchise. 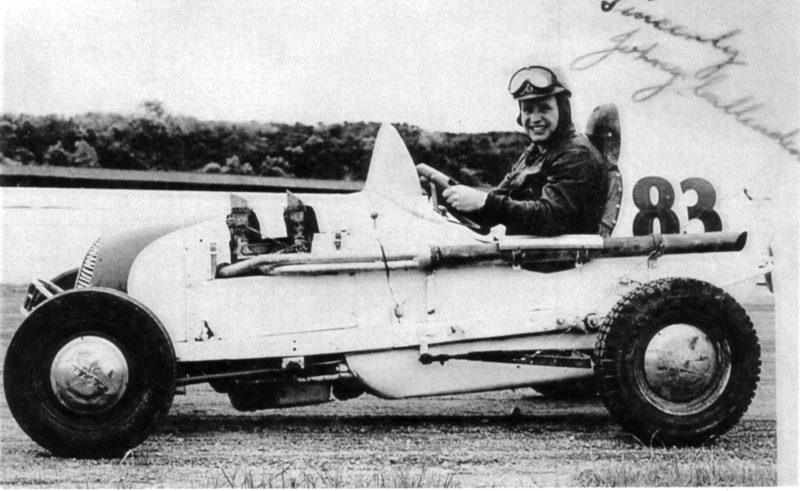 Johnny was supplied with a midget by Rowe and Healey which he drove in the early seasons of Waiwakaiho Speedway. He was made redundant by Rowe and Healey when an extra Rowe family member started at the business, which meant there was no room for Johnny any more. 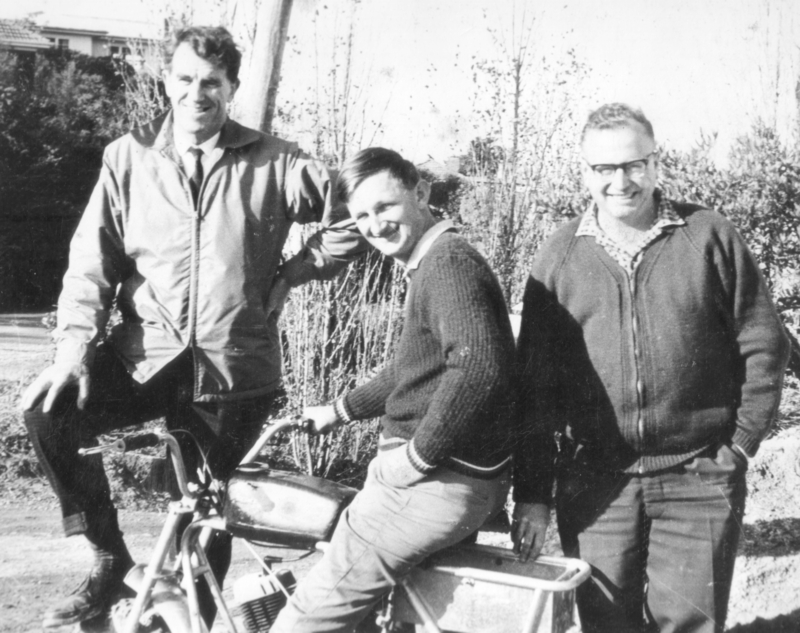 The first employee was Fred Cook from Stratford who was followed by Max Rook, Don Rutherford and Ray Christiansen, all of whom were involved with speedway except Fred who was a motor cycle road circuit racer. Later still the business was shifted to St. Aubyn Street but that also had a problem as it was prone to flooding. On one occasion a lot of stock was floating out the front door so Johnny yelled at the staff to start counting it as it went out and that would be the insurance stock take! Later, around 1974 the business was sold to Don O’Connor who had it for several years before selling to Jeff Strampell who later closed it down in 2003. For many year’s a close friend of Johnny was Deny Bourke who was an undertaker and they would spend many days out at sea fishing from a smallish boat. When TQ’s were started in Auckland two of the founders of the class, Johnny Missen and Vern Davenport, would travel down together from Auckland with their cars and always arrived at Callender’s in Clemow Rd just before noon on Saturday for a hot roast meal! Vern used to tell Mrs. C that her meals were like Xmas dinners as he apparently came from a poor background. One day Laurie opened the door to them and they had plastic Beatles wigs on! While Mrs. C did the gate or supper the “Callender kids” Laurie and Jan would play around outside but “Everyone new the Callender kids so they came to no harm except when Jan fell off the water truck and broke her arm” The official duty of Laurie and Jan would be to sell raffle tickets to all the people under the grandstand after speedway. When Laurie was old enough he would enter into the kid’s tyre race on Easter Monday which he invariably won because Johnny would select for him the thinnest and lightest tyre he could find in the motor bike shop. Johnny was injured once when Colin Johnston spun in front of him in his TQ and Johnny rode over the back wheel. The car upended and he slid along upside down and did damage to his face and the inside of his mouth. 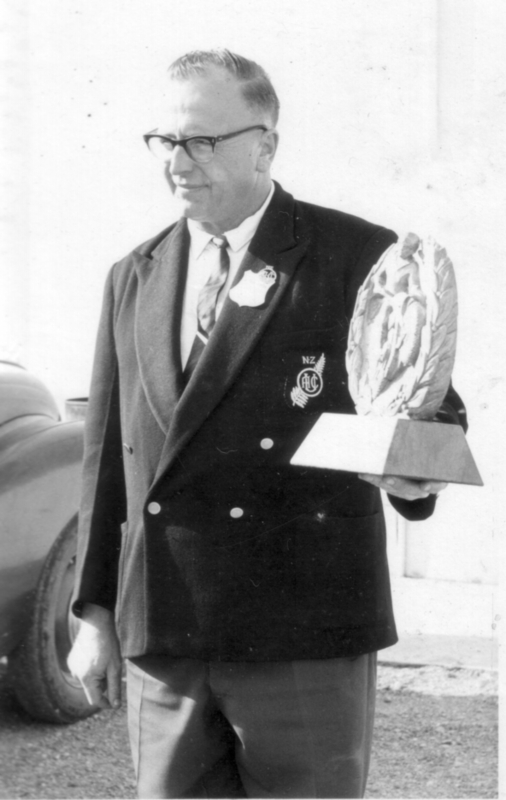 Johnny drove first a Bradford van and later a Vanguard station wagon and each was used as the ambulance for the various sports that Johnny attended. There were many times Mrs. C was asked to quickly empty the back of the van for a trip to hospital with another injured person. (This writer had a Callender van trip when I broke my leg at a Go Kart meeting out at Waitui sports day). If he was not competing he was an official and/or public announcer with his loud speaker gear. Then later as well as Waiwakaiho speedway, it was Go Karts and again he was official, competitor and announcer. It was always a fact that Johnny, Mrs. C and kids would be first at any event, as Johnny had to erect the speaker system, then last to leave as he had to pull it down and pack it into the van. And not just motor sports as he did the same for roller skating too as the kids were involved in that sport. “They were dance partners but they used to fight like mad so I was glad when they gave that up.” Laurie went on to collect medals for national speed skating and Jan won several individual dance trophies. Johnny was President of the Roller Skating club for quite a while. The speaker system was like a separate business that Johnny ran. It was called “Mellotone” and he was employed at many other outside functions such as horse racing and gala days. This business, including the Bradford van, was later sold to Don Rutherford. Towards the end of his days in the shop he developed the ‘Mountain Goat’ farm bike. When production started the “Goat” was built in an old bakery building around the corner and this was run by Jack Sleep. When Laurie left school he was an apprentice at Gray and Inch. Later he and Jan lived at Kaukapakapa north of Auckland while working at Mollers in Auckland. Jan was from a farming background so they are currently ‘small farmers’ in South Taranaki specializing in Dexter cattle and have for many years run the national organisation for small farmers. Among the many nick names Johnny acquired over the years was ‘Almanac’ for ‘Callender’ and ‘Cecil’ as his name was Cyril John Callender and “Fat Boy” was only used by close friends!. Another name was Johnny ‘Shoe-horn’ Callender because when he built the TQ he was ‘quite portly’ and needed a shoe horn to get in to it. Laurie was “Shorty” for obvious reasons, “I never started smoking because I was told it stunted your growth!” and also ‘truck’ -- Keep up now!—Laurie---lorry---truck! and of course Sir Lawrence of Arabia. Johnny is shown here with one of his Mountain Goats that was taken up the Himilayas by Sir Edmund Hillary, left and Peter Mulgrew sitting on the machine. In 1974 Johnny and Nola made the big shift to live in Auckland and ran a couple of Motels but Johnny suffered ill health. He passed away in 1978 after a series of heart attacks.